This Comfort series-position recliner is designed for comfort, versatility, pressure relief ease of use. Made with vinyl upholstery. 3-position headrest provides the comfort needed Activity tray included. 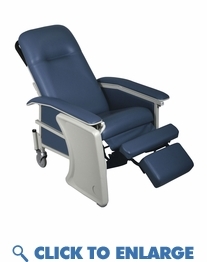 This Comfort series-position recliner is designed for comfort, versatility, pressure relief ease of use.